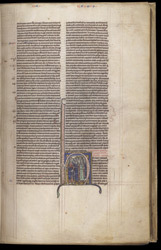 Most medieval Bibles contains the 'Vulgate' version of the text, which was translated from Hebrew into Latin around the year 400 by St. Jerome, or revisions of it. This copy was illuminated by a professional Parisian illuminator who seems to have lived near the cathedral of Notre Dame, and who signed his name, 'Master Alexander', in another manuscript. By the 13th century this manuscript was in England, and in 1449 it was owned by the church of St. Michael's, Crooked Lane, London. The initial 'H' which introduces the book of Exodus shows Moses (identifiable by his horns and halo) leading the Israelites out of captivity. He carries the rod with which he would part the Red Sea, and bring water from a rock.